We are chugging along the Siberian plain in our eight car train, which is now attached to a conventional train with another 15 or 20 cars, making this one very long train. The landscape is occasionally dotted with decaying grey wooden homes with ten roofs in small village clusters with no paved roads; but otherwise it is vast and vacant with groves of birches, endless brown and green grass, and lots of standing water left from melting snow and heavy spring rains. Novosibirsk, the capital of western Siberian is our next stop, late this afternoon, and then three other cities before arriving in Irkutsk and then Lake Baikal. There is lots to catch you up on. The beginning of the Siberian Odyssey got underway five days ago in Moscow where we changed hotels to meet up with our tour group. Switching from one hotel to another turned out to be a challenge since half the streets in Moscow were closed for the May 9 VE Day celebrations. Two strong, young hotel attendants helped us roll our bags a few hundred yards down a back alley connecting with another main street where we flagged down a taxi. Of all the things to be wary of in Moscow, taxis are high on the list, notorious for overcharging unsuspecting tourists. Some would argue that I am the quintessential unsuspecting tourist. Well, this cab driver not only charged us a reasonable rate when the roads leading to our new hotel were closed off, he parked the cab and escorted us cheerfully (rolling my bag, while Embry rolled hers) a good quarter mile to the hotel. The second hotel–Moscow Kempenski–was even a notch above the Intercontinental. Situated next to the Moscow River , it provided spectacular views of the Kremlin and had a luxurious bar, fancy restaurant and world class fitness center. The grand fireworks show that evening was directly above the hotel. At dinner we assembled for the first time as a group. Who would these people be? Where would they be from? Why were they on the tour? There are 99 people on the tour occupying eight train cars. There are about 40 Germans, roughly the same number of French and a handful of others—mainly Swiss, Italian and Spanish. There are five Americans, along with several Brits and one Irish couple. Our group—the English speaking group—consists of 18 people, all the native English speakers plus four middle aged Israeli guys, a mother-daughter(twenty-something) couple from Barcelona, and a young Italian couple, who are on their honey moon. We are not the oldest. There are two energetic, British ladies travelling together who are probably around our age. Except for the young Italian couple, everyone else is “advanced middle age” or older. After five days of traveling with these people, I am happy to report that everyone we have gotten to know is friendly, and there are no complainers. Enthusiasm about the trip and about Russia is high. It is a good group, and certainly a diverse one. 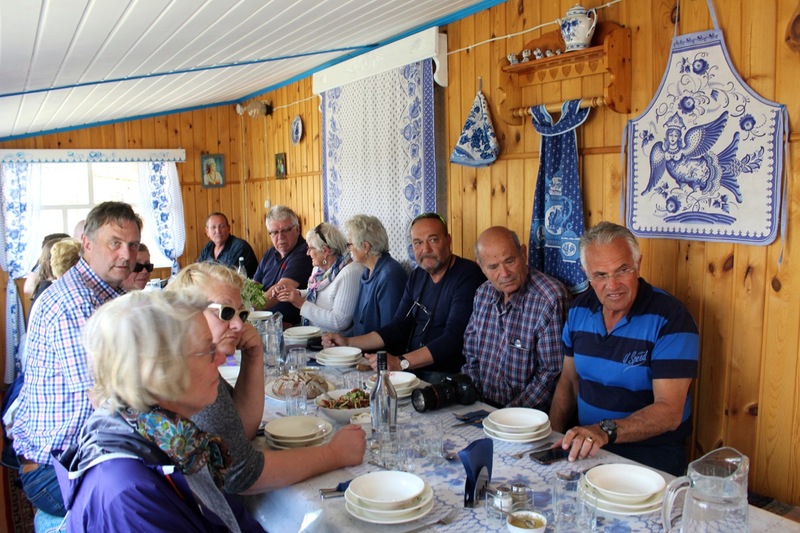 We all eat together and take the same bus when touring towns and cities along the way with our English speaking guides. A word about the guides: they are about as good at they get. The person who is heading up the entire tour is Hans, who works for Lernedee, the German company which is tour operator. He speaks English with an American accent and could probably pass for an American in the US. 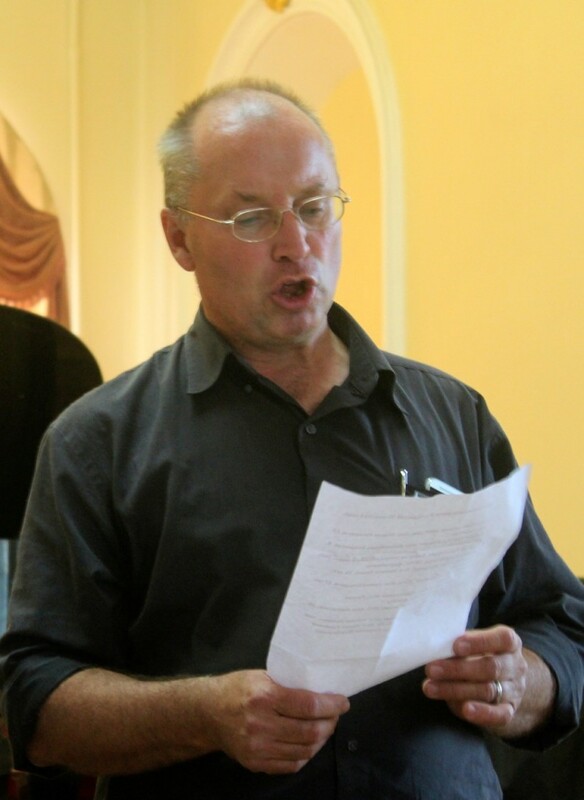 He has a contagious sense of humor, gives thoughtful and informative lectures over the loudspeaker in both English and German (sometimes in French) on various Russian topics and is ubiquitous. He came up to me yesterday calling me by name (no one has a name tag) asking what I thought about Russia. Does he know everyone’s name on the tour? It turns out that Hans’s real specialty, however, is China. He lived there eight years, writes and speaks Chinese; and when he is not leading tours, he is running a small management consulting practice assisting Germany companies doing business in China. The person who is responsible for the 18-person English speaking group is Ekaterina, a Russian probably around thirty and like Hans, an excellent English speaker. She diligently keeps us together and on time and is herself an authority on many things Russian. When we take a tour of a city along the way, we are joined by a local guide who takes the lead on the tour that day. The first city we visited outside of Moscow was Kazan; and since Ekatrina is from that city, she was our local guide that day as well. So far we have spent a day touring Moscow, a day in Kazan and a day in Yekaterinburg. Both Kazan Yekaterinburg are in the top five in population with about 1.3 million each, well below Moscow (over 13 million) and Saint Petersburg. Kazan is known for its Muslim and Mongolian influence and for its religious tolerance, Yekaterinburg for its heavy industry and the site of the murder of the last Czar and his entire family by the Bolsheviks in 1917. Because of its military significance (nuclear bombs are manufactured here), it was off limits to all tourists until 1991, following the collapse of the Soviet Union. So far, so good. The train accommodations on this special tourist train are a far cry from the train we took in 1993 when Andrew and his friend, Bronson, lead us and a dozen of our friends on a wild ride across Siberia. In those days every aspect of the experience was Spartan. The only things you could get in the dining room were vodka and dried fish. The food now is excellent and a marvel as to how they serve it so efficiently to forty or fifty people at one sitting. The cabins are small and compact but pleasant, and we have our own bathroom. So far the train has been on time and on schedule to the minute. 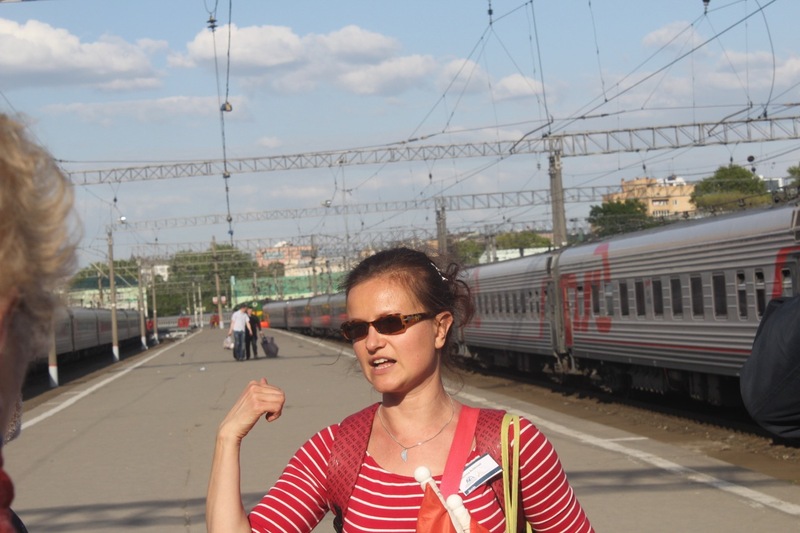 I do not know what the non tourist Siberian train is like nowadays, but my guess is somewhat better than in 1993 but not a whole lot. If there is any shortcoming about the tour so far it is that there is too much packed into each day. It is sort of like a cruise ship in that the train travels at night, you arrive at the next destination in the morning, spend all day touring a city and return to the train, which departs late afternoon or early evening. My walking app shows we are walking between five and seven miles a day and that is good, but it borders on being too much and sometimes comes awfully close to a forced march. We are exhausted at the end of the day. But so far it has been worth it, and we have learned and are learning a lot more about Russia. That we will be the subject of another blog. 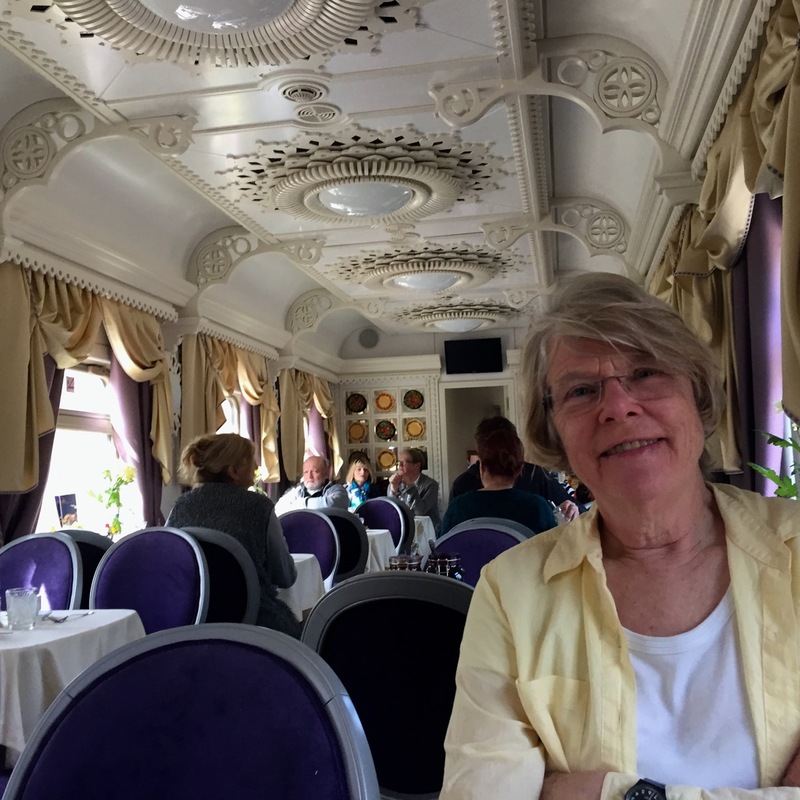 Good heavens… Siberian train travel certainly has gotten more luxurious over the past 20 years… I can’t believe the look of that dining car! When we made that journey in 1993 there was nothing to eat for 4 days but instant mashed potatoes, dried fish and vodka! Glad to hear your are having fun and have not gotten stranded in Omsk or Krasnoyarsk. Eagerly awaiting photos of the lonely Siberian steppe.